Author C. B. Dixon – Books. Life. Wonder. That is incredible. It’s been a crazy five years. I know deep in my heart that my writing has flourished since I have started. I still have to work on my timely manner and get blog posts out on time. Maybe that will be my five year goal. I will make a plan and stick to it. A goal that I might have to try out very soon. In the past five years, I have gone through many mini projects. I had tried to start a youtube channel about our adoption and found that it wasn’t for me. I didn’t want to make my child’s story public. I attempted many different writing styles that lead me to start a new blog so I could slap down thoughts about life things. This blog doesn’t really correlate with my writing life. In short, I had spread myself thin trying to find my voice. My presence online became a scattered mess over the five years I’ve been on this blog. Time for the cleanup crew. I am still in the growth of my voice. I know now that I should be me and only me. Through doing that I will find people that are like me. I will always learn from the greats but I will never be exactly like them because they are not me and I am not them. I can still be one of the greats. I will do it my way. It’s terrifying that it took me five years to crack out of my shell. I am here. Here is now. Youtube is a great resource for me to grow as an author. I love watching other authors give their opinion on how to develop a book. The same goes for podcasts. I don’t think those are in my cards at the moment. As much as I want to keep my dive in personality. I have to think realistically…can I continue to produce great content and deliver in a timely manner. The answer is… not right now. I’m okay with that. These past five years have taught me one important thing. I can’t be everywhere at once. If I had a million arms and cloning abilities, then… maybe. Unfortunately, I’m not in one of my books. I can’t snap my fingers to complete a task. It takes time. It takes effort. It takes drive. On this anniversary of my five years of this blog, I want to say thank you for popping in and being here with me. There comes a time in a writers life where the story ends. That amazing feeling that follows. The phrase, “I just finished a book!” It’s bliss. The power that pumps through the veins after creating a world is addicting. The next phase of writing begins. The oh-so-loved revisions. I have talked about revisions before. For those of you that read it know that I don’t like them. The self-edits can be a touch dry. Extremely frustrating. And, downright horrible! There is something neat about them that I discovered last night. I can tell if I wrote the story late at night. I can tell if I was hungry. There was also a point where I was sure the writer in me was sleeping. I typically have music playing while I write out the stories. This is also shown in my writing. The layers of emotion that’s laced into a story is mindblowing. When I read I try to pick these things out in other peoples works with no avail. I wonder if I can pick these parts out because I wrote it. This is something I will study a bit more. I finished the second last set of revisions this morning at two AM. A few cups of tea, one bowl of popcorn, and a drive to finish! That’s all I needed to complete that round. I’m going to do one more quick read through before it goes to the beta readers. It was a neat feeling to finish Mortal Soul Ascension. This book challenged me as it pushed me to try new tricks in my writing. It’s time to do my last read over. The beta readers are waiting. Want a read that will get your heart pumping? Ever feel like a snail going uphill on a hot day? I’m sure every person that’s ever had to get something done has felt this way. I’ve been editing Mortal Soal Ascension all week. It was going great until today happened. I’m sure I’ve filled my coffee cup up everytime I’ve had a sip. I’ll stare at the page to edit out all those annoying mistakes… And, all I see is black and white. I can no longer see the words. I’m sure I fried my brain. I know I’m not the only one to hit a brick wall. It comes to us all in an unexpected slap in the face. I wanted to share a few things I do to get my brain back into the groove. The fresh air seems to stimulate my mind with new ideas. The exercise gets the blood pumping that wakes me up. Sometimes it’s that break from the house that gets things rolling again. If I’ve locked myself up in the studio/office day after day my mind goes stale. With a nice refreshing walk away I don’t feel so cooped up. For me right now I am working on this blog post. I have been doing the same thing over and over. Correcting grammar and rewording sentences. I have to admit it’s not my favourite part about writing. I love creating. Like I’m doing with this post. A fresh screen that gets manipulated by my voice. It’s hard to beat that feeling. Sometimes all it takes is a fresh start of another project that makes the more undesirable parts worth it. If your an artist or halfway through an assignment for school or work then take a break, work on another project you’ve put to the side. You might just find the inspiration to continue, plus you’re getting something else done. I read. The mental break is a blessing. Plus, it helps me with creating my sentence structure, grammar, and gives me new words. It’s like studying without the textbook. I set a limit to how many chapters, or a time that I will finish by. I know working at home can sometimes get carried away. When you go to a job breaks are scheduled. There you get a coffee, a snack, and maybe a conversation or two. At home, these fifteen-minute breaks are forgotten. We need to remember that these are important to keep our mind from becoming overworked. I know. This one is a touch weird. Give me a moment to explain. In the morning I make my coffee, grab an apple, and sit at the computer… before I know it, it’s 3 o’clock. By this time I’m hungry and mostly brain dead. I’ll have a quick shower. The fresh feeling of water perks me right up. I’ll make lunch to move around, getting that blood pumping. Fed and fresh, the project has become something more alive. This is the least favourite. This is the one I do when I know I’ve made up one to many excuses to walk away. You’d be surprised how well it works. We have to admit to ourselves that we are not inspired every hour of every day. Life doesn’t work like that. We need to schedule in time for our craft. It’s one of those things we need to do or it will never get done. Push through the lack of inspiration. Quit the negative thoughts and work through it. Remind yourself that it’s part of the job. We are stronger in our craft when we find the strength to overcome these moments. Stare if that’s all you can do. You’ve given the project that time of your day and you must see it through. Even if you get nothing done. Keep doing what makes you happy. I had to change where my books were sold last month. It was a heart-wrenching decision but I’m hoping that the outcome will be much better. I’ve been on the fence about Amazon lately. It’s nice to have whatever I want available at my fingertips. I’m a local shopper. I like to buy local first, then provincial, Canadian, and then worldly. It’s part of my plan to help out my neighbours first. I know lots of local artists, farmers, and weavers. I want to lend them a hand because I know how hard it is to become noticed. While I was remodelling my blog and website, combining them into one, I got thinking about how I was contributing to the local stores here with my book. I have Wicked Soul Ascension in all the local bookstores in town. It’s great walking in there and seeing that one sold. I was working on the Book section of the site when I noticed that I’m contributing to the Amazon take over. Don’t get me wrong, I think Amazon is amazing and useful. I love Chapters/Indigo/Coles. This is the Canadian bookstore that is widely known across the country. I then found that Barns and Noble is the equivalent in the USA. I have now put more attention into brick-and-mortar stores. Maybe you can call me old fashioned or Millennial. I’m just wanting to do my part in helping these companies with their businesses because I love walking into their stories. I love how lost I become in the worlds they shelve. What is your favourite bookstore? What country is that store in? For Blaze Nemasa there is no escape from the nightmares that hunt her. Hope maybe the only one who can save Blaze’s human soul. Demons lurking in the shadows are only myths, or that’s what Blaze’s parents told their adopted child before she fell asleep. That all changes when Blaze finds out the truth about her family which burned alive in a house fire on her third birthday. A book of Sin drags her deep into the underworld where Blaze learns the truth about her wicked nature. Wicked Soul Ascension is C.B. Dixon’s first book published. She grew up with her husband in the small town of Leduc, Alberta Canada. C.B. Dixon is currently working on Book Two of The Ascension Trilogy, Mortal Soul Ascension. C.B. plunges into nightmares to bring out heart pumping adventures. 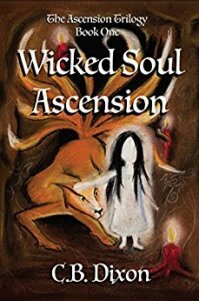 Welcome to the website of C. B. Dixon the author of Wicked Soul Ascension. At the moment she is in the process editing Mortal Soul Ascension, book two of The Ascension trilogy. Currently, she lives in a small town on the Sunshine Coast of British Columbia, Canada. She was born and raised in Leduc Alberta. Blue. I’ve always loved playing in the water as a child; lakes, pools, and when I had a chance to frolic in the ocean. I know, water isn’t actually blue, I was a child when I deemed blue to be my favourite colour. Yes. Two cats. One fluffy monster named Taz. She snores louder than anyone I know. And a tiny black thing named Midnight. She plays fetch. What was your favourite show as a teenager? I loved Anime as a teen. I got hooked in with Dragon Ball and then fell into watching Sailor Moon, from there I was a lost cause. If I had to pick a favourite it would be… Inuyasha. I was pathetic when it came to missing an episode. I’d cry and whine. Now, I have better taste in the Anime I watch. Here’s a writing question, what is the hardest part of writing? I find turning off the analytical brain to just get the story out of my head. If a red squiggly line pops up or the words aren’t quite making sense it’s hard to keep up with the story that’s unfolding in my head. I typically will save a half hour at the end of my writing spree to go over any easy errors. I would love to know more about you, my reader. Take the first three questions and run with them. Take the last one and tell me about your hobby, job, or whatever you’d like. Comment in the section below.